The 64th South Shore Frolics Parade included a band dressed as rabbits and a Hoan Bridge float. 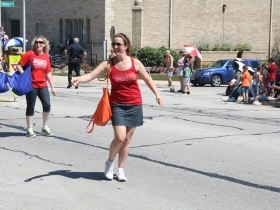 The South Shore Frolics Parade delighted children and adults alike on Saturday morning in Bay View. 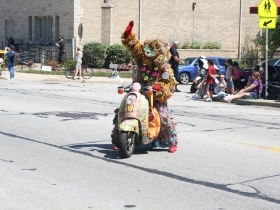 The lengthy parade featured standard parade fare like politicians and fire trucks, but also included unique floats like the Milwaukee Makerspace custom-built power wheels, two roller derby teams, a band dressed as rabbits, and a float modeled after the Hoan Bridge. And there was enough candy given away to tide one over until Halloween. 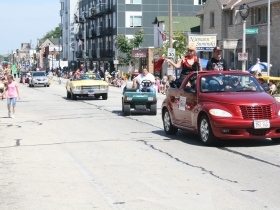 The parade was part of a weekend of events centered around South Shore Park, that celebrated it’s 64th year in 2013. 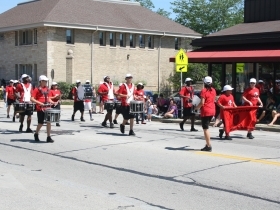 The festival is coordinated by the Bay View Lions Club with proceeds benefiting the Wisconsin Lions Camp. 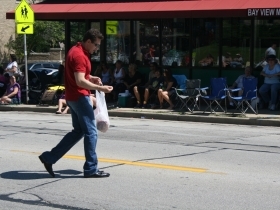 Besides the parade, events included multiple nights of fireworks, a car show, fish fry, free kids games, and live music.